Parents accompany children in stage A, which introduces infants and toddlers to the aquatic environment through exploration and encourages them to enjoy themselves while learning about the water. Stage A is offered to children aged 6-18 months and 18-36 months. 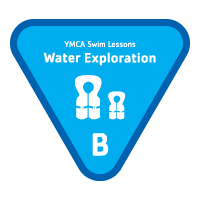 In stage B, parents work with their children to explore body positions, floating, blowing bubbles, and fundamental safety and aquatic skills. Stage B is offered to children aged 6-18 months and 18-36 months.